The new Ltd. Ed. EJ-200SCE Left Handed is Epiphone’s modern version of the “Super Jumbo” or as its better known among collectors, the King of the Flat Tops. And now there’s a model for southpaws! The EJ-200SCE is one of the most distinctive—and most beautiful--acoustic guitars in the history of popular music. But don’t just take our word for it. The “J-200” is known worldwide for its hourglass shape and strong midrange tone that has powered every major trend in rock, pop, country, and folk since it was first introduced in 1938. Today, the Epiphone Ltd. Ed. EJ-200SCE Left-Handed is the direct descendant of the singular acoustic guitar whose look and sound have been treasured for generations over all genres. King of the Cowboys Gene Autry, honky tonk queen Emmylou Harris (who now owns Gram Parsons’ J-200), the Everly Brothers, The Who’s Pete Townshend (who composed The Who's Tommy on his J-200), Reverend Gary Davis, Elvis Presley, Paul Weller, Keith Richards, Bob Dylan, and George Harrison have all recorded, performed, and posed for record covers with their Super Jumbos. The Ltd. Ed. 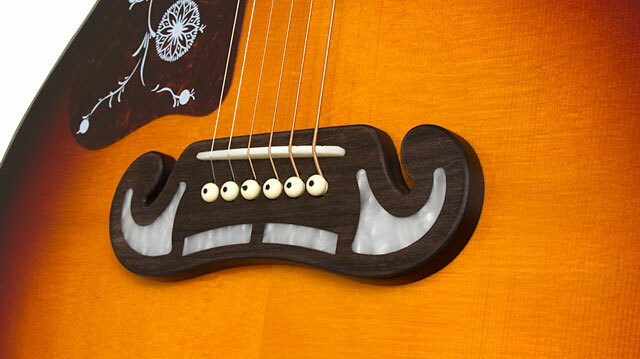 EJ-200SCE Left-Handed comes with Epiphone’s Limited Lifetime Warranty and 24/7/365 Gibson Brands Customer Service. Visit your Authorized Epiphone Dealer today and become part of history with the King of the Flat Tops! The Epiphone Ltd. Ed. EJ-200SCE Left-Handed has all the classic looks and sound of hard-to-find vintage originals including a Select Maple body, a Solid Sitka Spruce top and a striking cutaway for easy upper-fret access. The SlimTaper™ Maple “C”-shape neck makes it easy to hold full chords while keeping a driving rhythm. The fingerboard has vintage styled Pearloid “Crown” inlays and the body of the EJ-200SCE has 6-layer Ivory/Black inlay. The EJ-200SCE’s body back, fingerboard, and a Sloped Dovewing headstock have single-layer Ivory binding. The EJ-200SCE’s balanced tone makes it an easy guitar to amplify with the revolutionary Shadow® NanoFlex™ and NanoMag™ pickup system. The Shadow® NanoMag™ neck pickup is a revolutionary magnetic acoustic design featuring three samarium magnets that captures a wider, more balanced frequency range, as well as harmonics lost by regular magnetic pickups. The NanoFlex™ bridge pickup provides precise tonal fidelity that’s far superior in vibration transfer and amplification than more expensive, competing systems. The pickup is very thin and flexible allowing it to lie perfectly in the saddle tray to give the best possible contact from the saddle and the bridge. 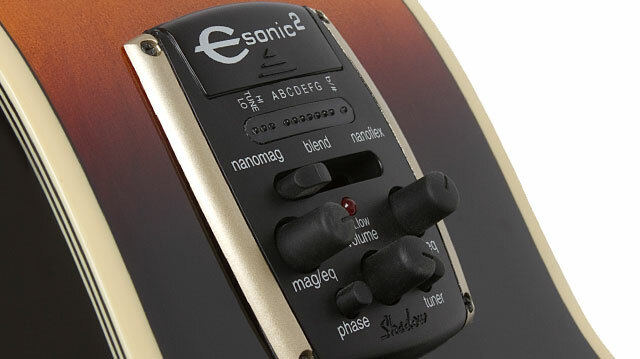 The NanoFlex™ and NanoMag™ units work together with the rim-mounted, Epiphone eSonic2™ preamp system and are then outputed to a mono blend via a ¼” jack or a stereo ¼” output jack. The eSonic2™ preamp system comes equipped with a convenient built-in electronic tuner which also acts as a mute when tuning or plugging in. Preamp controls include a Blend fader, which increases or decreases the amount of the NanoFlex™ and NanoMag™ output, separate NanoFlex™ and NanoMag™ EQ knobs, a Master Volume control, a Phase or “anti-feedback” switch, and a Digital Tuner control. The system is powered by two easily replaceable 2032 Lithium batteries that last many times longer than a dreaded 9 Volt battery. One of the “King’s” most distinguishing features is its “moustache” bridge and tortoise style pickguard which is modeled after late 40s models and is set off by two color finishes--Natural, and Vintage Sunburst. Epiphone’s hardware has always been the best in the business and the EJ-200SCE is no exception with features gold Grover® Rotomatic 18:1 Ratio tuners and gold screws on the traditional “bell” style truss rod cover.